Salthouse Harbour Hotel Townhouse HotelThis artfully designed boutique hotel and restaurant dazzles in the waterfront of Ipswich’s vibrant Harbour quayside. The Salthouse Harbour Hotel goes beyond what you expect and exudes its 4 star status in every curious corner, eccentric sofa and unstuffy cushion. The sea-salted brickwork exterior has been restored and rejuvenated into a ship shape contemporary warehouse of rich modern interiors and rooms adorned with vintage furniture, sculptures and eclectic art. From A12 Reach a roundabout on outskirts of Ipswich, turn right A14 towards Felixstowe. Take 1st turning off the A14 to Ipswich and Wherstead (A137). Head for Ipswich Town Centre. After 1.5 miles you come to a series of roundabouts, continue to head for the town centre. At the traffic lights get into the outside lane and go straight across and over a river bridge. Go straight across at next roundabout staying in right hand lane and right at the 2nd roundabout. From Ipswich Rail Station With Ipswich railway station to your right proceed along Burrell Road at traffic lights gos traight ahead onto Bridge Street and over stoke bridge(keeping in the right-hand lane) to the right of you there is a walkway running alongside the water, follow this (keeping the water on your right side) and the Salthouse is situated approx 1000yds on your left. I have been visiting Ipswich for many years and I have stayed at several hotels in the area, including The Great White Horse ( when it was still open), but I must say none of the hotels in Ipswich are the same ballpark as the Salthouse. The Salthouse is in a League of it;s own. I have stayed at the Salthouse maybe 10 times and it is always a delightful experience. The staff is always great , but I want to give a special mention to the night porter who is always fast and just fantastic! 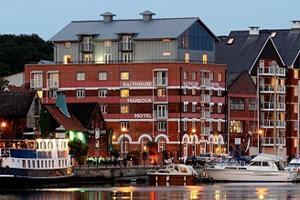 I think the 5 star ratings need now further explanation other than to say the views of the Marina are beautiful. In regard to value for money I always think there is room for spinning a few more deals , although I must mention that the Sunday food and room deal is great value. Perhaps a loyalty scheme should be added? For example I am a Hilton Gold member and that rewards me with free nights, but perks include free upgrade on arrival ( subject to availability) Free late checkout to 2pm or up to 5pm ( in some cases), but again subject to availability. And free executive lounge for select hours that has free drinks and snacks. I know it is just a small hotel, but I know a few boutique Hotels in Canada that have programs, so not unheard of. I gave three stars for service and facilities, simply because to get 5 out of me a hotel needs to have a pool or spa, a gym and a more extensive late night room service menu. If one doesn't care about such things, then consider this a five star hotel. I'll be back!